The footprints, found on England's eastern coast, are more than 780,000 years old. Scientists in the UK have discovered what may be the oldest human footprints outside of Africa on England's eastern coast. The footprints were discovered in Happisburg, Norfolk last May, and a study published Februry 7 in the journal Plos One describes the find and the species believed to have left them. The ancient mud where the footprints were preserved has been dated to between 780,000 and one million years ago. The oldest known footprints are preserved in volcanic ash at Laetoli in Tanzania, and are 3.66 million years old. Footprints are a rare find. For a footprint to be preserved, the imprint must face minimal erosion but also be quickly covered by sediment. 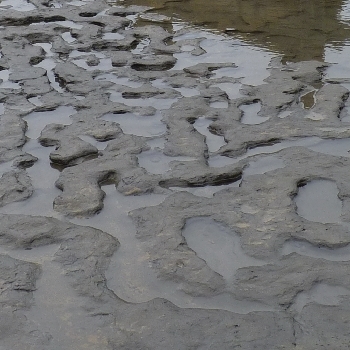 The footprints at Happisburgh were made in the mud of an estuary. When beach sand was removed from the site, tidal erosion caused by waves uncovered the footprints. Researchers used laser scanning and multi-image photogrammetry to record the footprints. A few weeks after their discovery, the waves had completely eroded the footprints. The study analyzed 115 hollows believed to be footprints. The length and width of the hollows are consistent with the ranges expected for adult and juvenile hominins, the group of species that include modern humans and our immediate ancestors. Accurate measurements of length and width from twelve prints with complete outlines showed that at least five individuals, of different ages, made the prints. Height can estimated from foot length, and the group that left the footprints ranged in height from just over 3 feet to 5 feet 9 inches tall. The spread suggests that adults and children were part of the group. Based on the estimated heights, foot sizes, and foot area, the researchers conclude that the footprints were most likely made by Homo antecessor. H. antecessor lived between 800,000 and 1.2 million years ago, and the only known fossils of H. antecessor are from northern Spain. Other circumstantial evidence for the presence of H. antecessor in Happisburg comes from stone tools discovered by the same research team in 2010. Dr. Nick Ashton of The British Museum of Natural History told BBC News, "[The discovery] will rewrite our understanding of the early human occupation of Britain and indeed of Europe." The British Museum will show video of the footprints at an exhibition starting later this month.